JH: Creating unique characters readers can easily tell apart is a handy skill for any writer. Please help me welcome Sarah McGuire to the lecture hall today, with her great tips on creating memorable characters. I hate having to flip back through a book to remember who I’m reading about—especially once I’m well into the story. Few things pull me out of a story faster. I knew it was frustrating to read, but recently, I had to tackle how to prevent that when I wrote. My latest book was a retelling of a fairy with a large cast of characters. 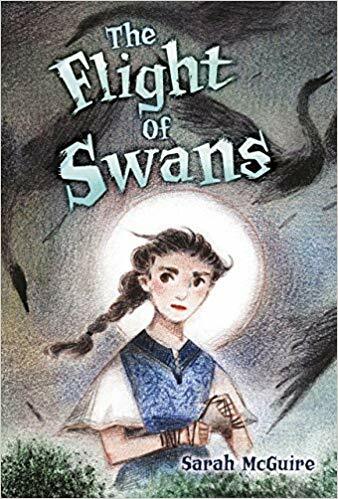 In The Flight of Swans, the heroine Ryn must save her six brothers who have been turned into swans. I had to distinguish six different brothers who were men only one night a month. As I worked on the manuscript, I used several techniques. There are two versions of the fairy tale I wanted to retell: Grimm’s “Six Swans” with six brothers or Hans Christian Anderson’s “Wild Swans” with twelve brothers. Of course I chose "Six Swans.” You’ll probably be faced with a more complicated decision, but if there is any way you can cut or combine characters, do it. Grouping helps people remember. There is a reason phone numbers and credit card numbers have groups of numbers instead of one long string. In my novel, I left the oldest and the second-oldest brothers on their own because those family positions are easy to remember. But I grouped the next four. The three middle brothers were triplets with their own unique dynamic, and the youngest brother was Ryn’s twin. If you’ve already eliminated or combined any extraneous secondaries but still have a lot to manage, ask whether you can group them according to age? Social status? Living arrangements? Be creative! Make sure the names are different! Literally, they should look unique on the page. It’s so ridiculously simple, but if you have many secondaries, you can’t afford names that begin with the same letter. In the same way, try to make secondaries physically different as well. This isn’t always possible—I was writing a story about seven siblings!—but you can be deliberate about what details you choose to describe. I worried that the brothers would blend together. So I began with a caricature for each brother and referenced it every time that brother spoke or acted, especially in the first part of the book. Starting with a caricature doesn’t mean your secondaries will be one-dimensional. It’s simply a starting point. For me, it was easier to make secondaries more nuanced once I’d figured out how to distinguish them. Aiden is the oldest, the family’s protector. Mael is the charming one, like Flynn Rider from Tangled. A really practical way to do this is go back through your manuscript and highlight the first ten or twenty things that each secondary character does or says. Those ten things should very clearly fall into your caricature for that secondary. If they don’t, make them more distinct. To go deeper, make sure that each of secondary characters interacts differently with the main character. You should know when and how they help—or can’t help—your MC. Think of your own family and friends. Who do you talk to if you need encouragement, or relationship advice, or business advice, or if you need someone to be angry for you? We don’t even dislike people for the same reasons! One person might be too demanding, another too nice, another dismissive. Aiden is Ryn’s protection as well as the authority she pushes against. Mael is the authority figure that encourages her to misbehave. Cadan’s sarcasm gives Ryn permission to not care so deeply, but he isn’t the most sympathetic brother. Gavyn offers wonderful, practical advice, but he always offers advice, even when it isn’t wanted. 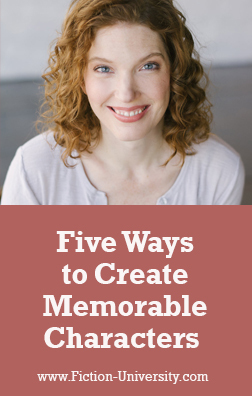 I believe that memorable description isn’t about how something looks or smells or sounds. It’s about how it makes the reader feel. In the same way, describing your secondaries is only a little about how they look or act. It is primarily about how they make the MC (and your readers) feel. Going deeper allows you to get at that aspect of description. These techniques paid off for me! The brothers became distinct characters—and they also helped enrich Ryn’s characterization, because each one highlighted a different aspect of her personality. I’d love to hear about how you distinguish and describe a wide cast of characters! What have you found most helpful? Princess Andaryn's six older brothers have always been her protectors--until her father takes a new Queen, a frightening, mysterious woman who enchants the men in the royal family. When Ryn's attempt to break the enchantment fails, she makes a bitter bargain: the Queen will spare her brothers' lives if Ryn remains silent for six years. Ryn thinks she freed her brothers, but she never thought the Queen would turn her brothers into swans. She never thought she'd have to discover the secret to undoing the Queen's spell while eluding the Otherworldly forces that hunt her. And she never thought she'd have to do it alone, without speaking a single word. Great list. I work a good but of humor into my books, so my #4 is often making a character the "comic relief. Love it! It really does help sometimes to have that snappy label as a beginning for each character.